Double sprockets are mainly used in roller conveyors to transport goods. 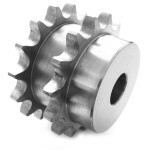 They have a special sprocket design with or without a hub. Two simplex roller chains are driven alongside each other on the same wheel. An appropriate gap between the two sprockets prevents them from interfering with each other. The torque is thus transmitted from one roller chain to the neighbouring roller chain.